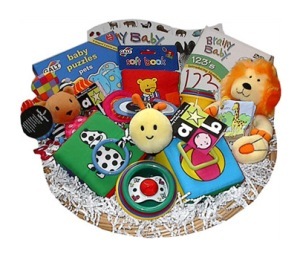 A baby toys gift basket is such a fun and whimsical gift for baby. Babies benefit from fun and stimulating "playtime" at all ages. Even newborn. Moms and babies will absolutley love this baby shower gift idea! The Little Learners Toy Gift Basket from Pretty Baby Gifts is full of educational baby learning toys for all ages from infant up to 3 years. It's chock full of crinkly toys, rattles, mirrors, soft and board books, and even an educational baby video. As far as I'm concerned the folks who came up with Baby Einstein products are genius! This Baby Einstein Toy Cart is filled with great eductaional toys. There is also a DVD and CD. I used Baby Einstein products (and currently use) for both of my children and I think they are fantastic. I absolutely could not have gotten through my daughter's infant years without their videos. It was the only way I ever got any house work done and could almost always calm her down through her colicky and fussy stages. She is 3 now and she STILL watches some of their videos and loves them. And yes, she did learn from watching those videos, although I was perfectly happy with the half hour of peace they gave me. Haha. The Personalized Welcome To The Jungle Baby! Gift Basket has so many colorful and cool toys. 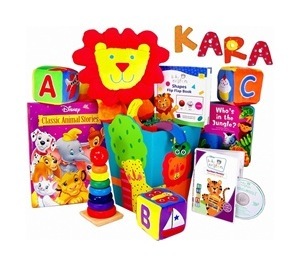 Theres a cute plush lion, lots of colorful blocks and color stackers, a great book full of classic animal Disney stories, and even a baby einstein DVD. A great buy and there free shipping too which is always a plus. You can find this baby gift basket at BabyGiftStation.com.